Craft a unique mug that makes a great gift or a one-of-a-kind container for your favorite beverage. This kit includes a 16oz. stainless steel insert (with lid), as well as easy-to-follow instructions on how to turn a beautiful mug. This is a terrific project for mid-level to experienced turners. It involves spindle turning and basic hollowing. Use stave construction or turn from a solid blank. Diameter at the lid: 3-5/16"
Diameter at the base: 2-3/16"
Minimum blank size: 3-5/8" x 3-5/8" x 7"
Very nice quality, received several positive comments. Easy to make. Instructions were clear. Going to make several more. Had fun doing this one, maple & walnut. I really liked these!!! I sold 10 the first day. try some differant size bits it's easier. I bought the kit just over a year ago and finally had the courage to make it. well work ti. Mark one got hot coffee before epoxy fully set and lifted a sixteenth but wouldn't push back in. Glad to try this new style. Looks good, right out of the box. Quality materials, well packaged. I make staved mugs. I sometimes like to make them without liners, but that requires excellent waterproofing, which brings up the subject of food safety and customer perceptions of food safety. 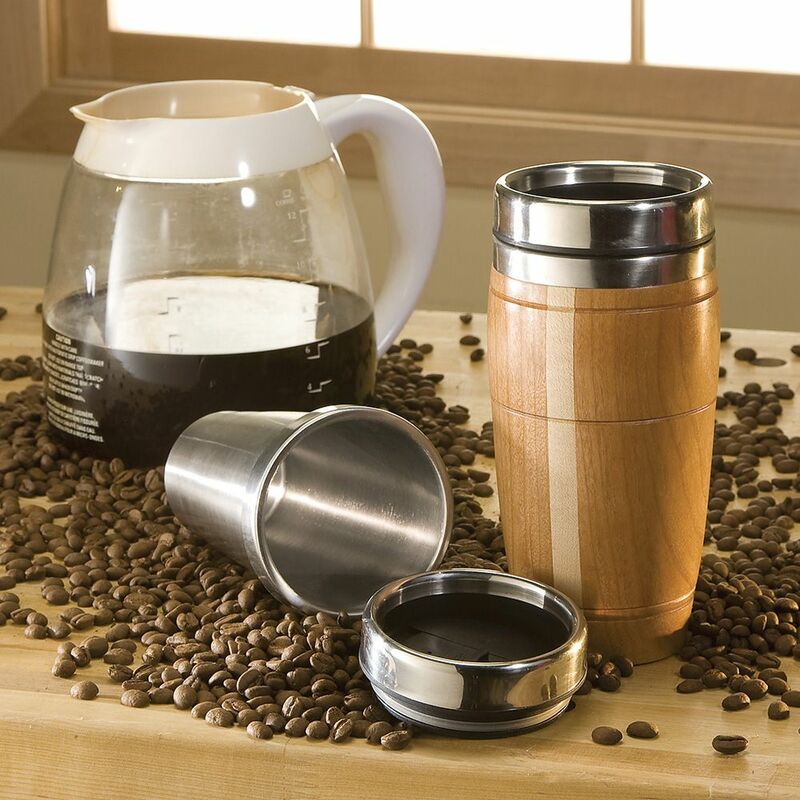 Food-safe epoxies are available on the market but these steel liners make a neat and attractive mug. These are available with and without a closure. The travel mug closure is great for coffee. These mugs come with excellent instructions. A moderate skill level is required to make staved mugs to the tight dimensions needed to fit these liners. I like it it is the coolest thing I have ever seen. I would recommend it to anyone. I have bought a number of these stainless steel inserts and they have been very consistent in dimension and quality. The lid is a pressure fit. Initially, I had concerns with the durability of the seal, as many travel mugs have screw top lids, but these have worked out just fine so far. 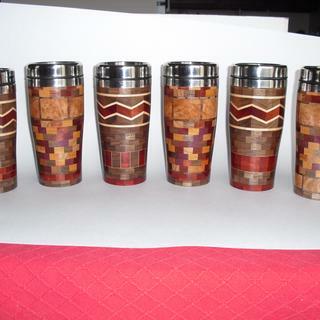 I really enjoyed making the travel mugs. I don't think that a beginner would appreciate it but me being an intermediate, It was challenging enough. Nice item. would like to see it with a twist off (screw) Lid. Made several for Christmas presents.Well received. 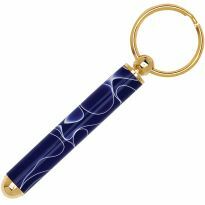 Should offer a promotion for large orders with free shipping. It was a lot of fun putting this together. 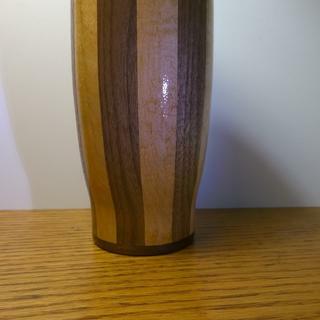 It was pretty straight forward making this into a segmented vessel as opposed to the recomended construction.I would recommend this to anybody who enjoys creating there own little piece of art. Over priced you can find the same insides in plastic ones. Remove the screw at the bottom remove the plastic and turn one out of wood. On the kits I got some of the lids did not have the plastic trimmed off all the way. Turned out pretty well. I was hasty and drilled through the bottom of one, and had to fix it, but all in all it was nice quick segmented turning project. This is an interesting project and an attention getter when complete. 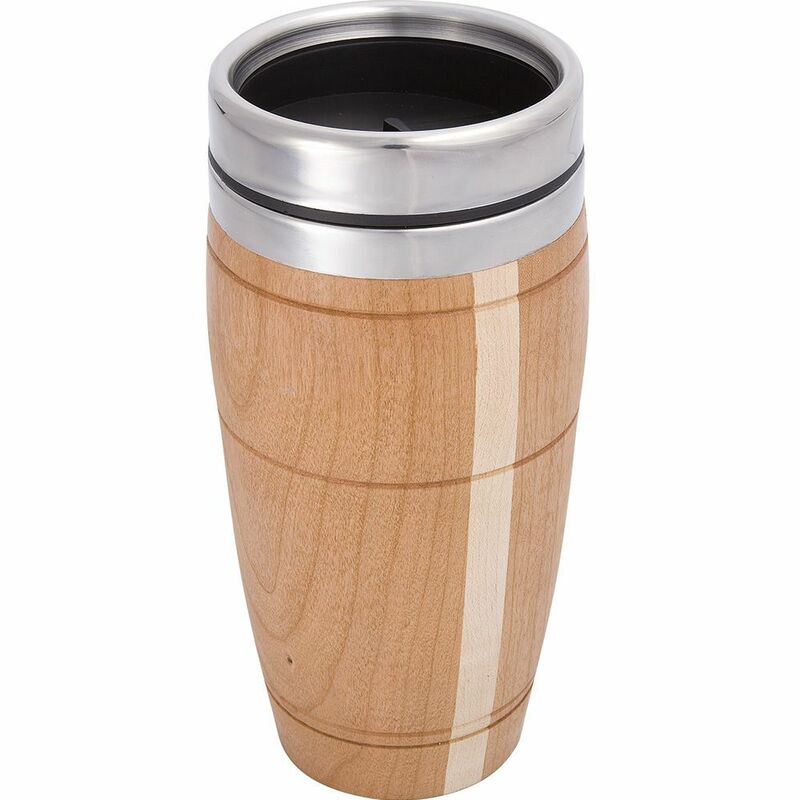 With the trent to carry your own drink with you getting so popular, making your own travel mug is a natural. 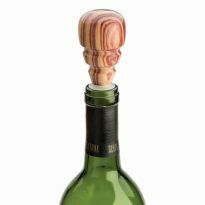 The result of your turning can be personalized with a carving or wood burning to make it evan more outstanding! I have ordered several of the travel mug kits for gifts. 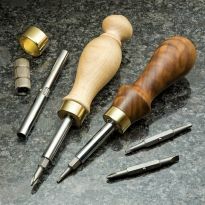 For the first project I did not have the forstner bit so I had to use a bowl spindle gouge. This method takes more time but it does work. Be aware of wood shrinkage as it dries when installing the insert. I broke one turned project attempting to get the insert to fit. Just for the uniqueness of I give it 4 stars. 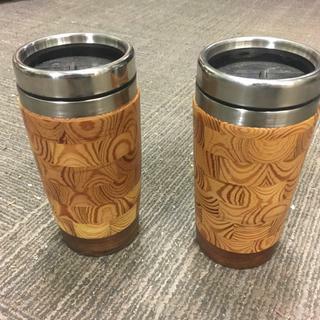 I made matching travel mugs for my wife and myself. Then had to make a set for son and daughter in law. My wife thinks they would make nice Christmas gifts for next christmas sooooo. I ordered and received 8 more. Will have to do them before Christmas. I enjoyed this project a lot. 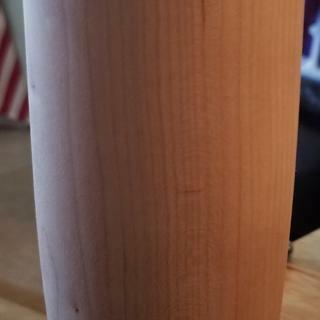 I used Hard Maple and Purple Heart. The instructions were pretty good. My biggest problem was clamping the pieces together, which after a lot of looking I found that 4 hose clamps are a great / cheap solution. I have interest from relatives already and am ready to order more. Neat project and the first I have turned of this size. 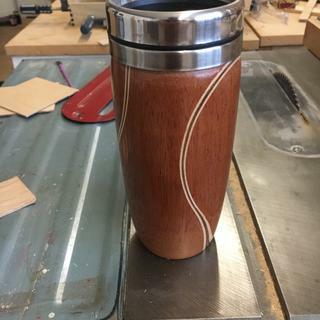 I had just recently purchased a midi lath and scroll chuck and enjoyed doing this mug. I built up a blank with black walnut, birch and cherry in the middle. I did not have a 2 7/8 bit so used a 2 3/8 and the 2 1/8, then finished up the inside with 3/4&quot; diamond side scraper that I just purchased and all has come together well. Will do this one again. This was the first project I had ever done on a wood lathe before. It was a lot of fun! I had some trouble finding a 2 7/8 Forstner bit....so I had to bore the inside by hand which took me about 3 hours. I really enjoyed it and my second kit is in the mail. Coffee grinder is next. Received this for Christmas from my son. I found the instructions were easy to follow. I did use a 2-3/8&quot; forstner bit part way down after the 2-7/8&quot; bit, then went to the 2-1/8&quot;. This cut down on some of my cleaning out the inside. The wood I used was from a neighbors tree they had cut down several years ago, not sure but think it was some kind of fruit tree. Since the pices was not long enough I added some oak. That was a mistake. I have only been turning for a year so didn't know what a problem two different hardness' of wood would make to turn. Well lesson learned. Next one will be made out of the stave construction. Good liner for hot beverages ...lid needs work. The down side is the lid provided in the kit barely fits. You can tip the cup upside down and it'll darn near fall off the liner. I used the lid from a cup I already had, it fits extremely tight and I love the cup (now). Kit is OK. It was difficult to hollow out the center and fit the metal insert. Using large foresner bits is dangerous with lathe. Get catches real easy and often. You have to feed bits slowly and carefully. Needs better method of hollowing out center. Maybe should use bowl gouge and bowl turning tools. Be aware that when hot liquid is put into the insert, it will expand. 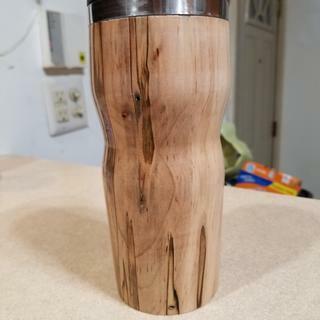 I had a turned wood sleeve split when pouring the liquid into the mug. Allow room for expansion and/or warm it up slowly. Really great idea especially to make as gifts! but since wood is not a friend of water & cannot go into the dishwasher what about keeping end product clean and protected? I've purchased several of these over time and have found that every one of them has the slide on the lid fall apart at some point, a little CA glue to the temporary rescue. I have accidentally pushed down on the slide on a couple mugs, while putting the mug in a bag, and had the slide actually crack from finger pressure. I've even had the whole plastic part of the lid separate from the stainless ring, and I saw that there was so little adhesive inside that it surprised me it had stayed together when I took it out of the box. The stainless parts of the kit are top notch, but anything made of plastic seems to be about as low-quality as possible. If there's a way to get another lid that will fit on the cup portion of things, go for it. I purchased 4 of these and after a little time the stainless steel top ring came off the top of the unit. never even got to make them. I felt it wasn't worth the return shipping to send them back. 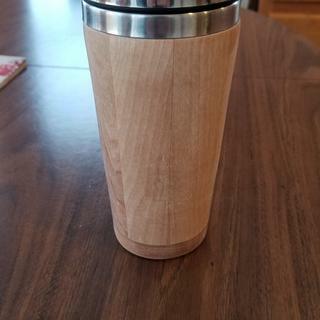 My son will be using a lathe in his HS class and will be making a coffee mug. I can't wait to see the finished project. Some people prefer a press on lid over one that screws in. To try something new and for gifts. I've made these before, it's a nice project and they make great gifts. 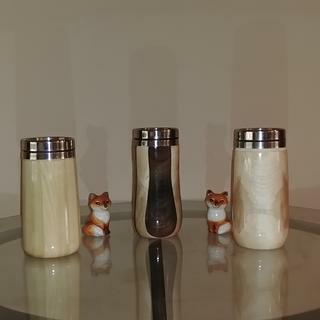 Local Woodcraft changed to screw top lids, and I'm turning several and wanted them to be the same. I like the pressure lid better anyhow. 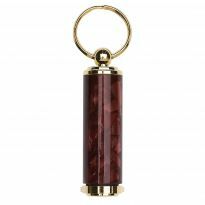 I have purchased one previously and it is a quality product that I enjoyed making. After people see this cup they all want one. Have not use yet still sitting on the shelf waiting for me. On sale. Backordered. Do not expect until March. On sale for a reduced price, this seemed like a good time to experiment. I have used up my current supply of them and need more for Christmas presents. I like travel mugs and this one looked inyrtesting. This is a gift for my Dad who loves woodworking and especially turning small gifts for his friends. I teach woods in a high school and I use this kit with students. 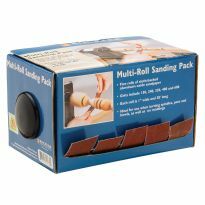 Simple, elegant, and looks great with little effort and a lot of sanding. Big hit with friends and family! I highly recommend these mugs! Great price and the quality is consistent. New Englanders love their coffee on the go. Putting customized leather sleeves on these is a perfect product for our company. I have purchased in the past. My wife has one that I made and she runs in to people that request one. 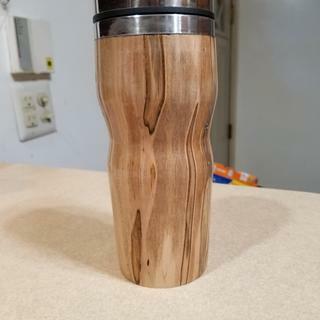 My dad does pens and I thought turning travel mugs would be a neat change for him. My husband actually requested this! Makes Christmas shopping a bit easier! ð??? Is there a version of this project available with a vacuum insulated cup? 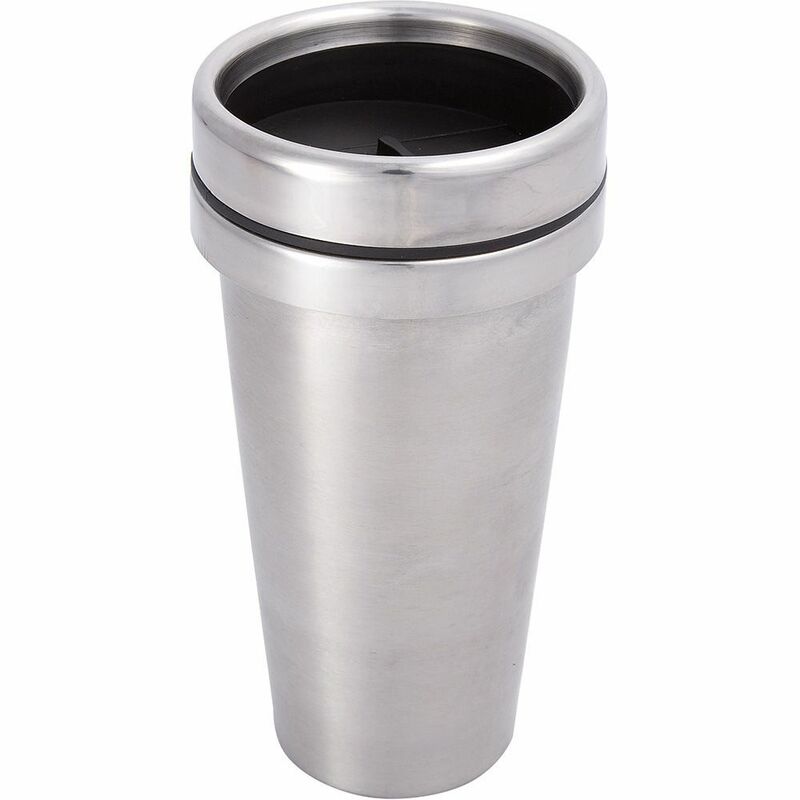 SS vacuum insulated cups for hot or cold beverages are all the rage now. BEST ANSWER: I have not found one. I have turned something similar for the nissan vacuum sealed bottle as it is thin and easy to do. But I have not seen an actual vacuum sealed cup kit. I have some large pieces of cherry and some other wood. 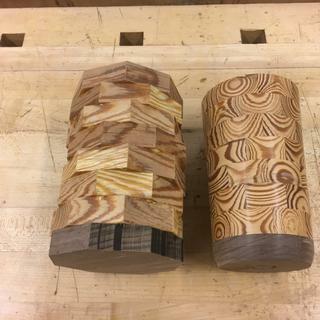 Is there any reason not to make the sleeve from a single block of wood as an end grain deep drilling/turning? BEST ANSWER: Should be no problem, as long as the wood is very dry, about 6-7%. I have made 6 so far, but all out of stave construction with glued on bases. Have used the 1st one daily for over 6 months, no problems. Used wipe on arm-r-seal, inside and out. Glued with gorilla urethane (the expanding foam helps insulation) and a seal of silicone around inside of rim. Thanks, I had not thought about using urethane glue and silicon. I've made four using solid blocks (one was cherry) and they turned out great. I sell them for $40.00 a piece to coworkers and $50.00 to general public. I have several more orders. Cherry block will be fine. just be careful parting off the bottom because it is end grain. No problem, IF, the Cherry is dry enough. Just tough deep drilling/turning. That's what I plan to do with. I did that with the vase and it was fine. There is no reason you have to. I make my using segmented rings. will the heat or cold radiate thru the insert and wood? BEST ANSWER: The heat will radiate through the wood, it does get warm but not to the point that it is uncomfortable. I drink hot coffee out of mine all the time, my wife has had iced tea in hers and it does get cool, but does not sweat. If you leave a fairly big air gap between the insert and the wood it would probably be cooler but the outside dimension of the wood would also be larger. iPhone this helps you out. I've made 20-25 mugs. 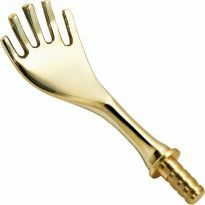 Use one for coffee. It never gets too hot, warm but, not hot. 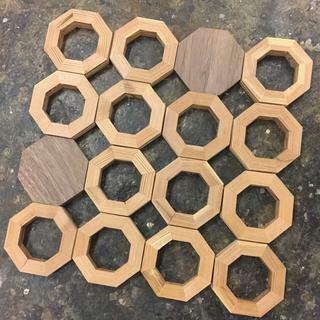 It's a great project for all skill levels, I've made one piece and I've done segmented. Have fun with it. You will feel some warmth but it will not be too hot to handle. I love mine so much that I am getting another to leave at the office. Yes, but not much. I changed this by adding a layer of insulating foam in between the cup and wood. Did you use spray foam? Does the insert have a push in or screw on lid? BEST ANSWER: The mug has a double edged gasket that is pushed on to seal the contents which works very well. The insert has a push on lid. BEST ANSWER: I’ve never tested to see if liquid would come out if it was turned upside down but I would guess that it would. It doesn’t look like a sealed closure where the spout is. I did notice that the lids could retain water in them after washing. I just give them a few shakes in the sink to get it out. I would say that part is a design flaw. I need just the lid. The metal on the top of the lid had separated from the plastic and now traps liquid when drinking it. Gross! Anyone know how I can get two lids that would fit this base? I made a mug from this kit many years ago but the gasket has worn out, is there any place I can find a replacement gasket or lid? BEST ANSWER: I am not 100% sure if you can order a direct replacement or not. However a trip to the dollar store should provide you with ample gaskets and or lids to use as replacements. Do you ship to Australia ?